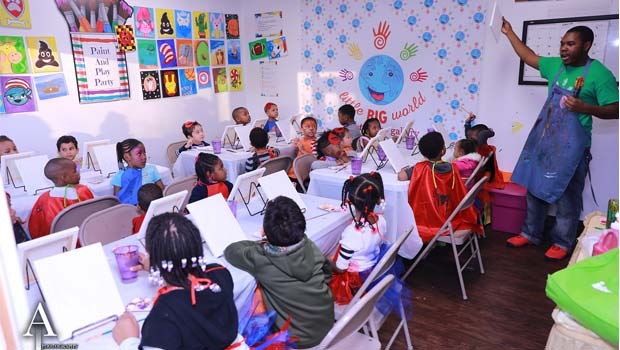 Our Little Big World Oak Park Birthday Parties indoor playplace / playground parties and paint parties for kids! Our Little Big World birthday party packages offer an indoor playground that features play equipment, play cubicles, a sandbox, and much more. There are many all-inclusive fun birthday party packages to choose from and several add-on options, including a child’s paint party! Let Our Little Big World handle all the birthday party details for you! Our Little Big World is an all inclusive party facility that will take care of everything from set-up to clean up…all you have to do is show up. Our Little Big World birthday parties are perfect for all ages, from crawlers to 13, there’s fun for everyone. Our Little Big World has several different birthday party packages to choose from, as well as add-on options. Our Little Big World provides the most popular themes, but if you have a different one in mind, contact their event specialist… they can do it! Contact Our Little Big World at 248-308-5444 to reserve your party now! Additional information about Our Little Big World parties can be seen at their party page www.ourlittlebigworld.com/birthday-parties.